For “Peppermint”, Julio Bashmore’s collaboration with Jessie Ware, director Noah Harris offers viewers an abstract glimpse into his rave experiences and headspaces from the ’90s. 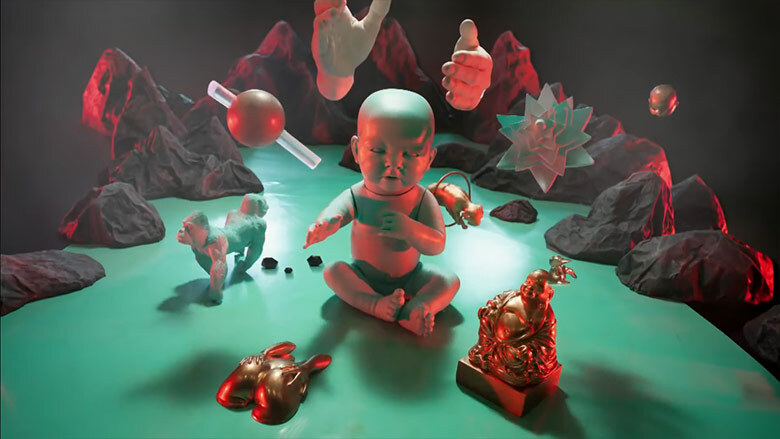 Using found and 3-D printed objects, Harris brings to life a maddening, undulating collage of female forms, gods, creepy babies, and old-school toys, closely synced and timed to Bashmore’s erratic rhythms and Ware’s delightfully repetitive vocals. Read on for an interview about the music video’s chaos came to be. Can you tell me a little bit about the concept behind the creation of this music video? The base concept of the video is pretty simple really. It’s about evolving loops. elements that start out as simple pieces of graphic design but evolve into beautiful glittering objects. Of course there’s another more complex layer of narrative, in which we see a diva born whose head gets impregnated by god via a mysterious blue elixir, leading to the birth of an inane rave baby surrounded by a multitude of objects representing the demented visions of her mind. Visually, I wanted to create something slick and detailed, but also very tangible, visceral even. Real objects, tangible form… I’m a huge fan of blurring the boundaries between the real and the computer generated, The vision should always exceed the technique. Music videos that feature close audio-visual syncing can sometimes come off as trite or cliche in their execution, but this music video doesn’t seem to have that problem. Were there any personal rules or ideas that you tried to keep in mind when working with this kind of synthesis? Hmmm, not sure I agree on that point, well, I guess two points – I’m not sure you can lump all closely audio-visual synced videos together… and I’m not sure that I would necessarily think of them as trite. I think I see your point though, in that this kind of syncing is probably a very simple idea to come up with, so therefore an easy approach to conceptualizing a video. This track has a very simple palette of sound, but is put together in such a way as to create a rich immersive piece of music. That’s something I wanted to achieve with the film too, so the idea of representing each of these sounds with imagery, which then evolves over time seems very relevant. I suppose I use this audio-visual syncing as a vehicle to tell a story in this case. It’s more than just about how image and sound goes together, although of course that is a hugely important part of the film. How random or spontaneous was the process of choosing the items you used, particularly during the most chaotic portion, which begins at around 2:35? The film was meticulously planned and designed, but from the outset part of my plan was to trawl junk shops and car boot sales for objects, which could, alongside other objects, form loops within the film. Some of the loops in the film are 3-D printed so were obviously more planned than others. Others mix 3-D printing with found objects, and others are purely found elements. This approach definitely bought a randomness to elements of the film, which was entirely necessary and integral to the idea, but of course this randomness got assimilated into the overall vision as production went on and as such became part of the overall design. It seems that this music video is a bit of a stylistic departure from your previous work. Would you agree? How long have you been working with three-dimensionally-rendered objects, and what draws you to them at this point in your life? I guess it’s a departure from my recent work, but it’s a return to what I love and the kind of work I was doing more of a few years ago – immersive, intricately detailed and designed film making. I came into film from a graphic design background and still work as a designer. Projects like this that allow me to really focus all my skills are perfect. I get a different kind of satisfaction from doing something like this than I do on something that is all live action or all typography for example… Projects like “Peppermint” satisfy on so many levels. For previous work of mine that sits in this kind of world look at the rebrand I did for UK channel E4 back in 2007, or my Ford Fiesta or Google Chrome ads. 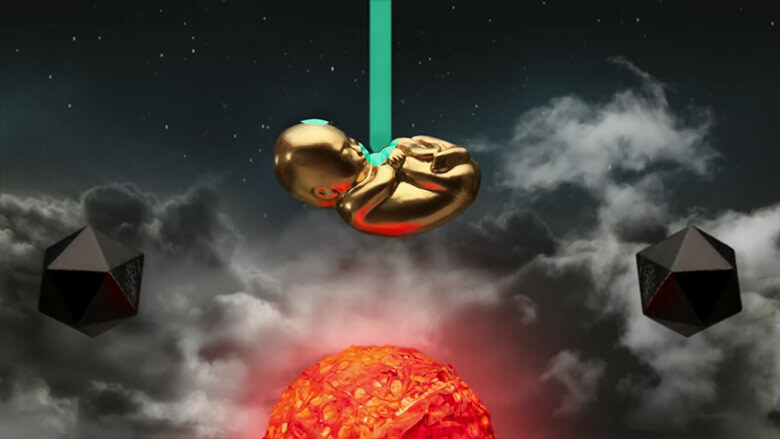 I am especially fond of the liquid poured from the heavens onto the gold baby and into the woman’s mouth. Can you tell me a bit about the symbolism behind that, if indeed there is any? Yeah, I love that sequence too. It’s a beautiful part of the film; I thought it was going to look great when I wrote it, but it ended up exceeding my expectations. There’s a lot of symbolism in there, but I do like to keep a little mystery to these things. Let’s just say that this film is influenced heavily by my experiences in the early 90s in the heyday of rave culture. I was 17 in 1991, it was a hedonistic time. There’s a load of symbolism in this film around that. Read into it what you will! Do you have any personal favorite moments? Throwing modesty out the window… I have loads… The whole first sequence printed on paper. Although it may not be as immersive and impressive as some of the more 3-dimensional stuff that follows, there is something so crisp and precise about the design of that section. I love the icon that represents the handclaps, with the half circles firing off gold lightning bolts. 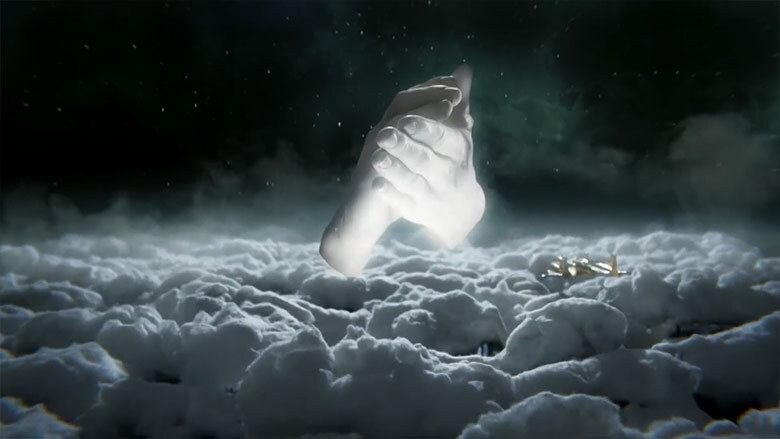 I love the reveal when we go from space up over the clouds to find the god hands hammering away. The whole cloud scene came out so well. It’s like a fully realised 3-dimensional rave flyer up there. But I guess my favourite shots in the film are the side view of the girl’s head as the blue liquid comes down and she opens her mouth, and the two shot sequence where we see her head open to reveal the lake inside, and the baby is born… sublime! Are there any ideas or techniques you’d like to explore that are at the forefront of your mind? What do you have planned in the near future? My entire career is based on new ideas and techniques! It’s just that right now I don’t necessarily know what the next ones are.. which surely is a good thing. The way my creative brain works best is generally in response to a problem / brief / music track etc, so it;s not like I have ideas stacked up waiting for a project to come along (although there are a few of those, I guess). The way I work is much more about creating a very specific response. To me, this film is the perfect accompaniment to Julio’s track. They go hand in hand. If I had been asked to make a video for a different track instead at that time, it would have been a very different film.